The annual Academy of Motion Picture Arts and Sciences Awards are one of the most popular televised events. The glamour of Hollywood, the heat of competition, the excitement of having a film you love win is all delivered in one memorable package. The actual awards cover every aspect of the motion picture industry. The Best Picture Oscar is given to the producers who plan out the project and pay for it. The Best Director Oscar celebrates the vision and passion of the filmmaker. The four acting awards validate careers and mint new stars. There are awards for writing, cinematography, costume and art design, as well as all aspects of sound from effects to songs. 2016 marks the 88th annual celebration of Hollywood's elite, and while the global audience is not the mythical “billion” that has been promoted in past years, 35 million U.S. viewers can be expected to tune in. Acting is one of those pursuits that can be honed through hard work, rigorous training, and years of experience. Otherwise, anyone could be picked from a crowd and made into a star. But the technical side of filmmaking takes a lot of training and apprenticeship, and going to certain schools to learn these crafts helps students develop the skills needed in the industry. One measure of which schools are most successful in this is to tally up the major awards their former students have won. This list reflects a variety of schools; some concentrate on technical aspects like animation or recording, some are large and include both acting and filmmaking programs. New York University’s Tisch School of the Arts produces both Oscar-winning directors and actors. Martin Scorsese, Woody Allen, and Joel Coen are some of the directors who have dominated American cinema over the past four decades, with six wins between them. Angelina Jolie, Anne Hathaway and Whoopi Goldberg have all won Best Supporting Actress awards. Philip Seymour Hoffman won the Best Actor award for playing the title role in Capote (2005). But it is Steinhardt School graduate, composer Alan Menken, with eight Oscars, who leads all NYU graduates. Berkeley graduate Gregory Peck won the Oscar for his portrayal of Atticus Finch in To Kill a Mockingbird, but most alumni Oscars have been earned in technical categories. Mark Berger, Berkeley graduate and adjunct professor in their Department of Film & Media, has won four awards for sound mixing. Joe Letteri won four awards in special effects, three of those working with director Peter Jackson. Costume designer, Edith Head, was nominated for 35 awards between 1949 and 1978, winning eight times. Sound engineer, Loren L. Ryder, won six awards and is notable for contributing to the American effort in World War II when General Patton called upon him to disguise the sounds of American tanks at the Battle of the Bulge. An incredibly eclectic list of Oscar-nominated talent has attended Columbia, and their list of winners spans American film history. Brothers Herman J. (screenwriter) and Joseph L. (director) Mankiewicz combined for five awards. The prolific songwriter Oscar Hammerstein won two Oscars for Best Original Song. Leon Shamroy, who studied mechanical engineering, was nominated for his cinematography 18 times, winning four Oscars. Composers John Williams and Marvin Hamlisch have combined for 11 Oscars in various music categories. Oscar-winning actors Kevin Spacey, Kevin Kline and William Hurt all studied at Juilliard. Four-time Oscar-winning composer Henry Mancini attended Juilliard before being drafted into the U.S. Army in 1943. He served as an infantryman before transferring into the Army Band. Alumni of the UCLA School of Theater, Film and Television have been recognized in 28 international film festivals and competitions. UCLA is the top “home team” for Hollywood, winning more Oscars than any other Southern California school. Director Francis Ford Coppola has won five Academy Awards. Composer John Williams scored his 50th nomination this year for Star Wars: The Force Awakens (2015), winning five Oscars over the years. Director and screenwriter Oliver Stone attended Yale for a year, dropped out and returned for a second year before finishing at Columbia. Actor and director Paul Newman, whose sole Oscar came in 1986 as Best Actor in The Color of Money, attended Yale before leaving for New York’s Actors Studio. Since 1979, MFA graduate from the Yale School of Drama, Meryl Streep, has earned more accolades than any other actor with 19 acting nominations and three wins. Robert Zemeckis, who directed the hugely-popular Back to the Future trilogy, was known as a commercially-successful director when he picked up an Oscar for Forrest Gump (1994). Lyle Wheeler was nominated in art direction 29 times, winning five Oscars. Sound designer and director, Gary Rydstrom has earned 17 nominations and 7 wins for such notable films as Titanic (1997) and Saving Private Ryan (1998). Producer Wendy Finerman shared in the Best Picture Oscar for Forrest Gump (1994). Benjamin Glazer was one of the founders of Academy of Motion Picture Arts and Sciences and won two Oscars for screenwriting. Songwriter Ray Evans won three Oscars, including one for the classic "Whatever Will Be, Will Be (Que Sera, Sera)". Matt Damon shared an Oscar for co-writing Good Will Hunting (1997), while Mira Sorvino (Mighty Aphrodite) and Natalie Portman (Black Swan) won acting Oscars. Actor Jack Lemmon was nominated eight times, winning as Best Supporting Actor for Mister Roberts (1955) and Best Actor for Save the Tiger (1973). Composer Johnny Green was a prodigy, entering Harvard in 1924 at age 15. He went on to win five Oscars. 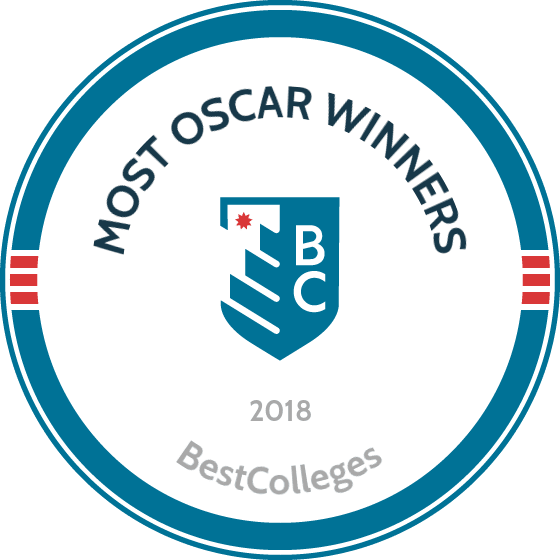 The only junior college on this list, Pasadena City College has had a number of alumni go on to successful Hollywood careers. Director John Singleton became the first African-American nominated for Best Director for Boyz n the Hood (1991), and he picked up a second nomination for the screenplay. William Holden was named Best Actor for his role in Stalag 17 (1953). Dennis Murren has won nine Best Visual Effects Oscars. Ranking was based solely on the total number of Oscars earned by alumni at each university. Several of the winners attended more than one school on this list. If the person started at one school and graduated from a second, the second school is credited with the Oscars. In the cases where an undergraduate degree was awarded by one school and the individual went on to film school or a graduate program, both schools receive credit. Because of the nature of acting and “getting that big break,” some Oscar winners attended school for a year or two before becoming professionals, and in those cases, the schools received credit.